There’s cockiness, then there’s confidence. 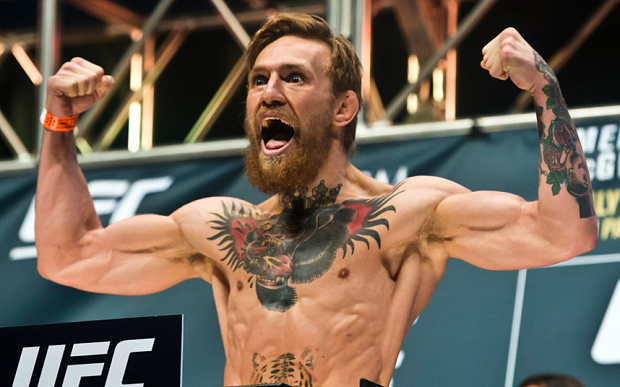 Here’s why we feel UFC’s Conor McGregor has the latter — and how you can have it. First thing’s first, I am not a UFC fan, at all. I don’t like it, don’t dislike it. I just don’t understand the appeal yet. But I’m sure we could all appreciate the sheer amount of physical and mental discipline needed to get recognized in any combat sport, let alone one as difficult to excel at as mixed martial arts. For those who don’t know, that insane-looking guy at the header is Conor McGregor, currently the #1 ranked featherweight contender in the Ultimate Fighting Championship rankings, and one of the most closely followed breakout talents in the sport today. I’ve first heard of Conor McGregor in an interview on Conan . What struck me was that unlike other fighters that to me seemed cocky, he was just plain confident in a matter-of-fact way. Yeah he did look a bit douchey, but at the same time, he seemed a likable kind of douche. I was obviously not the only one to notice this, and a small YouTube Channel Charisma On Command actually made a video breaking down key parts of McGregor’s seemingly natural but totally attainable levels of confidence. Yes, you can be this confident without looking like a blowhard or like you’re obviously selling something. You have to work on it though, as you’ll see in the video below. We strongly suggest you watch that video, but we’ve included the biggest points the creator made. This might seem counter-intuitive, but the simplest way to be confident is to put hard work into your craft. It’s easy to be confident if you know what you are talking about. In the start-up context, this means building prototypes and creating good products before creating pitches. It means knowing you can deliver before saying you can. Because if you think about every little thing that you can’t, you will go crazy. At worst, you won’t feel that you could act on anything. You do have control over many things, not the least of which is yourself. When you know what things you are able to affect, the right kind of confidence just comes with it. Visualization can serve as a great substitute for practice in situations where such a thing is impractical. Sports where top athletes train separately from each other and entrepreneurship are two such situations where the right kind of visualization helps. By the right kind, we mean the sort of visualization where you realistically try to tackle issues, not the ones where you just imagine what would happen if you won the lottery. Visualization has to be based on as many objective realities as you understand them. Confidence is directly applicable to many aspects of entrepreneurship as well as creativity. Management, presentations, convincing others that your work is of value, are just some of the many areas where confidence plays a crucial role. How many dreams have been left as dreams, simply because we don’t find it in ourselves to act?